My 5 month old GSD respects me, male, but he constantly bites my wife and my 2 daughters hair on the back of their head. Is this a dominance issue? How do I put an end to it? Training, training, training!! 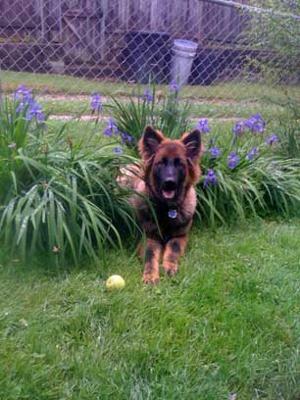 Dog training - your GSD puppy needs to go to a dog training class - and the other members of your family too. Why? So you'll all learn how to deal with the puppy and your puppy will learn how to respond. to each of the members of the family. If I were you I would find a dog training class asap in your area. There are many dog training courses on the internet too but an actual class that you all go to with your puppy just can't be beat. Why? Because there are so many benefits beside just the dog training - there is the issue of bonding with your pet, socializing with other animals and people and loads of other issues. Either way, you need to nip this bad behavior in the bud asap! Good luck!